The Ringling Archives was started in the 1990s. Located in the Tibbals Learning Center, the Archives includes The Ringling Collection, John Ringling's Papers, and the Circus Collection. The Archives also preserves copies of all of the printed material the museum creates, including brochures, gallery guides, maps, invitations, and much more. However, the Archives's records of these materials from 1946 to 1995 are incomplete. We are asking if you have a stack of Ringling exhibition guides, if a grandparent or friend has a drawer of Ringling maps, or a single brochure gathering dust in the attic from 1946 – 1995, consider donating it to the Museum! Please note we cannot accept in-person donations. All donations must be mailed. The items we are looking for do not include newspapers, guide books, travel brochures or any printed material not created by The Ringling. 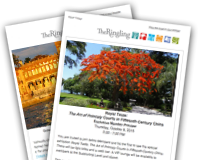 If you are not sure, please email your questions to archives@ringling.org . All materials sent to The Ringling will be considered a donation; we are not offering reimbursement for postage.